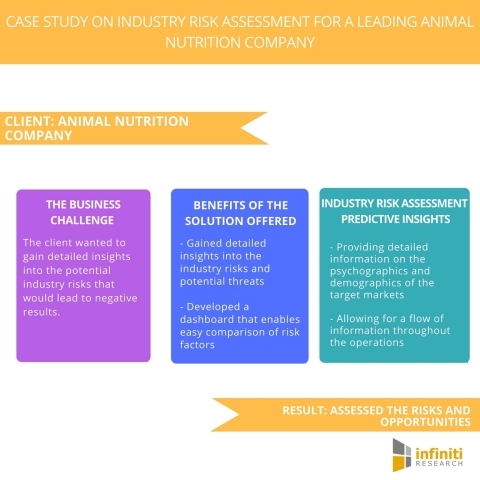 LONDON--(BUSINESS WIRE)--Infiniti Research, a global market and customer intelligence solutions provider, has announced the completion of their new industry risk assessment study on the animal nutrition industry. A leading animal nutrition company wanted to leverage risk assessment-based solutions to assess and group the risks based on specific geographic areas. Animal nutrition concentrates mainly on the dietary needs of animals, mostly those in food production and agriculture, and also in aquariums, zoos, and wildlife management. Animal nutrition organizations are the ones that create and deal with the production of feed additives, nutrition premixes, and other related services. The industry risk assessment solution offered by Infiniti helped the client to ascertain thorough insights into the potential risks that helped them in creating an easy to use dashboard that allowed them to find and compare industry risks in different geographical segments. The client wanted to wanted to gain detailed insights into the potential industry risks that would lead to negative results.